I have decided to redo this post. Why? Because it has now been over three years since I put it up and over 2,000 people have looked at it. The very first thing I would like to say is that I believe in the use of Black Salve BUT care NEEDS to be taken when using it. ONLY USE SMALL AMOUNTS AT ONE TIME. I could NOT tell that I had this 'thing' in my hand. I could NOT feel anything. It was as if the skin underneath was normal. How wrong I was. This is a CAUTION you CANNOT tell what is under the skin. It may be nothing or it may be very large. You NEED to consider this BEFORE you use it. Make sure you do your research and then make an informed decision. I would also recommend that you consult your doctor if you believe you have skin cancer or melanoma and once you have a diagnosis then you can make a more informed decision as to which way you will go. I did actually go and have a regular skin cancer check, unfortunately not one of the 'things' I have killed off where picked up by the doctor. The only spot he was worried about had no reaction with the Black Salve. Now I can not blame doctors for not picking these things up, I could not either, I just put the Black Salve on to see what would happen. Please USE YOUR COMMON SENSE. Go to the doctor if you find anything on your body that is not normal and get it checked out. 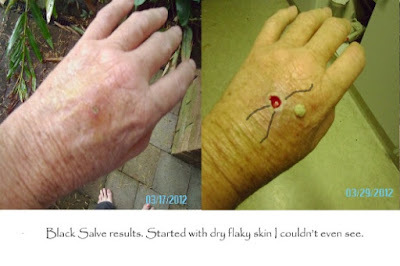 When I first started using the Black Salve I placed it on four different sites I was worried about and had no reaction. I thought I had been sold a dud but I was wrong it just meant there was nothing wrong on those sections of my body. My first try using Black Salve. I had two tiny pieces of dry skin that kept coming back after I picked them off and thought I'd best put some Black Salve on it thinking that it would be just like the other nine that I have killed on my face (at that time), in that the eschar would fall out after five days and only be 2-3mil wide. I was wrong. Please note that the three black lines on my hand top right ONLY indicate where the pain in my hand was. 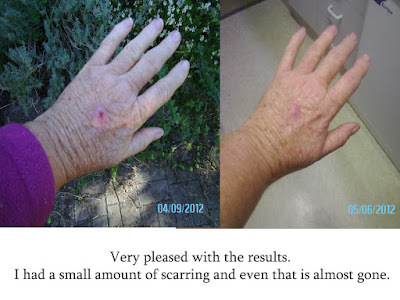 The photo above on the left is how my hand looked after using Calendula for six days and then moving on to Comfrey. When the wound was all closed up and I had scar tissue left and this was because I picked the thing out instead of waiting for it to fall out. DO NOT DO THIS. I used Rose Hip oil until now when I only have tiny bit left. (2012) I am now using MacArthur Paw Paw cream. I have taken about 6-7 weeks to get to this point and I only have a tiny amount of scar tissue left to go. I am extremely pleased that this thing in not living in my hand anymore. I've come back in to add this bit. A month or so has gone by and still the tiny bit I had left would not heal. So I put some more Black Salve on. Buy the next day I had found I had something there. It was about the size of a pin head. Now that is gone the MacAurthur Paw Paw cream has almost removed it. A few weeks later I came back to say that even though the hand is healed there is still a a small lump under the skin and the bump is only half the size. No one would really notice except for me. I have put Black Salve on again and again it has caught something. The lump has completely gone now and I'm just waiting for my hand to heal. I have been meaning to put this photo up for so many years and finally I have managed it. You can see that all that is left (in August of 2015) is nothing but a small star of a scar. 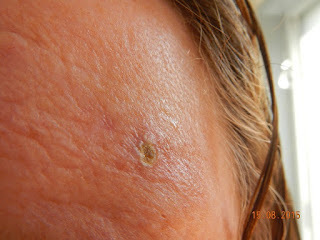 I have put Black Salve on just a couple of weeks ago and no reaction. It has been a long process but I can tell you I would rather this than have that thing in my body. So far I have found no other suspected cancers. It is now August 2012 and I have been fighting the scare tissue. I eventually put some more Black Salve on which I found helped get rid of most of the scare tissue and DID NOT find any more cancer(?). This was my 7th go with Black Salve. Six times it found something. The 7th it did not. September 18th 2012. I have come back to add that there is still the tiniest of a bump (not a lump) and a small section (3mils across) that is still red. September 3rd 2013. Adding this on. I have no real sign that I ever had a cancer(?) on my hand. There is a tiny star where the hole used to be. There is no lump, no nothing. If you would like to read more click here. Since I started looking into and using Black Salve (in 2012 - click here if you want to know why) I have cleaned up 15 'thing's on my face. I can NOT say that ANY of them were cancer. Some of them (what ever they were) were only the size of the fingernail on my little finger. Others were only tiny dots, mainly around my mouth. I was just not willing to take the chance and so I have used the Black Salve to kill them. Below are the abnormal cells that I have killed off this week using Black Salve I have made for myself in 2015. This is on my forehead. It has been killed by the Black Salve I had made myself. I used it overnight, with a band-aid. 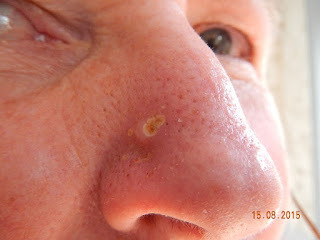 I have had a small lump on the side of my nose for years and nothing I have tired has rid me of it. I had to put the Black Salve that I had made on it for 24 hours to get this reaction. I did this in two separate sections during the day time, not at night. As you can see there are tiny spots on the outside and so when this cleans up I shall do it again to get anything else that is there. It is now 2015 and I have finally ran out of the Black Salve I had purchased (in 2012) from someone before he was shut down. Here in Australia it is illegal to sell the Black Salve as a made up ointment BUT you are aloud to purchase the individual ingredients and make it yourself, so I have been told by many a website. I am assuming this is because everything is natural and you can just go and buy them off the shelf at most health food stores and how do they stop that? It being illegal is of course a great shame but what else do you expect from the chemical companies that make billions from people being sick. Billions more is spent (worldwide) looking for a cure to cancer even though there is already one. Infact if you go looking there is more than one, granted not for all types of cancers but definitely for skin cancer and melanomas which here in Australia are a real killer. Thankfully with the help of thousands of people worldwide, and the with the use of the internet, the horse has bolted and the chemical companies can not stop the movement of people who have been let down soo much by them and unfortunately even some doctors must be included in this even if they never meant it to happen. Don't get me wrong there are times when the inventions from the chemical companies and the research and the doctors needed to cure the terrible diseases on this earth are most welcome but when they stop people from saving their own lives and have people thrown in jail all for the mighty dollar there is something wrong with man. But I laugh. Look at what is happening to this world with its love of power and money being at the root of it all. Even so even though I attempt to look after myself with natural remedies I DO USE MY COMMON SENSE and go to see a doctor if I think I need to. I have looked at some of the photos on the internet and they are horrifying and I wonder what where these people thinking, where was their common sense? Off on a holiday I think that is why I say use Black Salve ONLY on one spot at a time and ONLY IN SMALL AMOUNTS. When I started looking into Black Salve all those years ago I did not know much about it but now I have a better understanding. I thought you might like to know what I have gleaned from my use of the ointment and how I have made the ointment and why I made it the way I did. When 'people' on the Internet tell you 'DO NOT pick the core out of the dead sun cancer or melanoma' before it has finished doing its job they mean it. WAIT FOR IT TO FALL OUT NATURALLY. The reason is that as the cells are killed off your body will want to get rid of them (this is the pus - it means your immune system is working). The eschar (the dead cells) seem to arrange themselves into a cone shape with the point facing down into the body. Eventually as all else dies off there is left a root, or an anchor it could be called I have found that if you pull the eschar out and break that root then it will take months to heal and could end up with scar tissue. This of course can be rid by using a combination of Rose Hip Oil one time, then Paw Paw the next and then keep repeating this until the problem is solved. Remember I am only telling you how I did things. It may be different for you. I can ONLY say how I use the Black Salve. You must make your own choice. I ONLY use SMALL AMOUNTS at one time. The internet is littered with images of people putting on the Black Salve in, what I would call, large areas and it makes me gringe. I only use enough Black Salve that will fit on a normal band aid. This would be LESS than the size of a 5 cent piece (a little larger than the end of a pencil). My usual way of applying this is to do it overnight unless it is near the eyes and then I ONLY use it through the day time. DO NOT GET THIS IN YOUR EYES! In the morning I take the band-aid off and wash the salve off. If there is a reaction, no matter how small, I then put new Black Salve back onto a new band-aid and apply it either for the rest of the day or leave it until the evening to apply it when I go to bed it depends on what is happening on the day. I ONLY use it for a total of 24hrs but sometimes have found that 12hrs will do if the spot is only small. Once the 24hrs is up I then use either Calandula, Paw Paw to keep the area moist (this will help to keep scarring down and help with healing the area as well. I am presently doing an experiment with the two reactions (see photos above). I have made an ointment using Plantain, Sheep Sorrel, Red Clover and Bees Wax and I am using it to see if reacts the same way as Comfrey which is that it heals the eschar and makes the body not expel it but absorb it and rid it that way. The problem was that when I used Comfrey and found it doing this, with the hand, I couldn't stand the idea of my body doing that and I stopped. This time I am going to see what happens. My thinking is that if the body absorbs it then there will not be a hole. I will let you know how I go. When I made my first lot of Black Salve I did not want to add Zinc Chloride. I have read that if too much is added it will burn the skin and cause scar tissue so I wanted to make it without. It also worried me that it is called a poison. The problem was when I made my first batch, because it is made from natural materials mixed with boiled water and glycerine, it went moldy. A nice crop of mold it was to, all different colours. I didn't worry about it though. I cleaned most of it off and put the salve in the fridge (in the vegetable section down the bottom). This killed off all the mold except for two tiny bits and even these may have been killed off if I had left them sitting in the fridge for longer. I also noticed that even though I had cooked the mixture for thirty minutes it stayed a reddy brown colour. I decided to add a small amount of Zinc Chloride. I wondered if this was one of the reasons it was added. To stop the mold from growing. As I was using 250grams of dried material (which I had mixed into a wet ointment) I only added 100grams of Zinc Chloride instead of the 250grams recommend in most recipes with 150mil of boiled water. I then added it to the salve mixture and cooked it in a double boiler for 30mins. I have found that the mixture has now turned a much darker brown colour (not black but dark enough to stop it looking like something the dog had left on the pavement). When cooled I placed it in clean jars and have put it in the back of the fridge. If I think of anything else I will add it later. The internet is littered with websites about Black Salve. I have placed links to a few of them and then only for your information so you can make a more informed decision. I purchased my dried materials from this website. also she has a website. PLEASE NOTE THAT I DO NOT KNOW THIS PERSON AND CAN NOT VOUCH FOR ANY OF HER PRODUCTS OR INFORMATION. PLEASE USE YOUR OWN DISCRETION. I have also added another link concerning Black Salve in Australia. Again I do not know these people. I can NOT vouch for anything they say. You MUST always use your own discretion. I have looked at these youtubes and thought you might be interested. https://www.youtube.com/watch?v=wGhetfdyoHY It is a long video but I was glad to watch. Important he suggests a Black Salve that DOES NOT HAVE Zinc chloride in it. 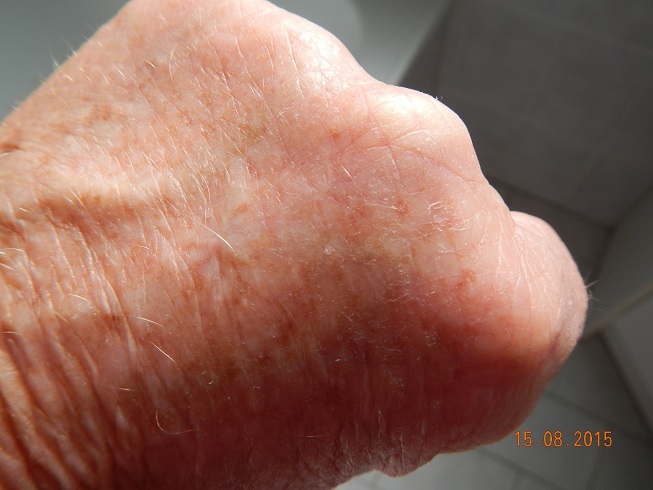 This man started using Black Salve when he was at Stage 4 of Cancer. Even though he used it and agrees that it worked on the tumors around the ear (which was the main tumor) he believes that by allowing the doctors to cut into them caused them to spread to the Lymph Glands and from there to the rest of the body. In the end I believe he has died. The videos certainly seem to be a really true account of his battle with cancer and what he did in attempt to beat it.As he said he wished he could have used the Black Salve when it was just a spot on his forehead.